A cockney funeral passes by. 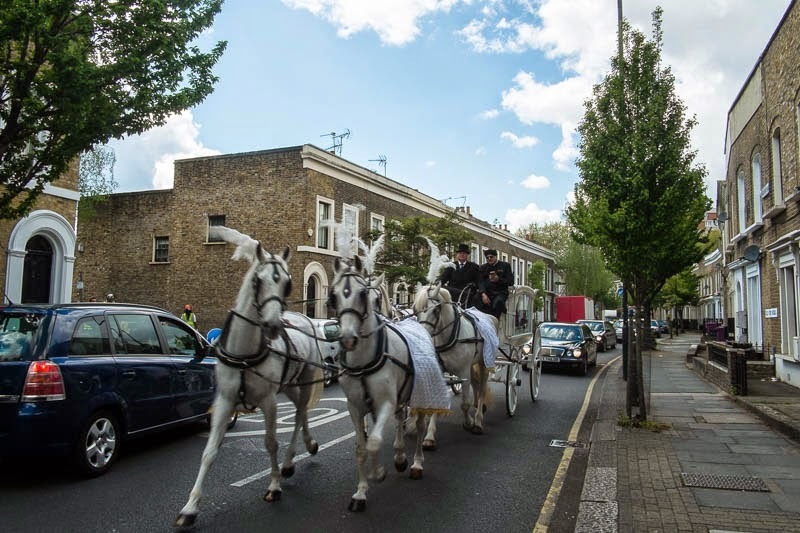 A glass carriage containing the coffin is drawn by four white horses with white plumes on their heads. The men in black suits and dark glasses who are paying their final respects following behind in the black cars with darkened windows. A ritual that belongs with a generation and culture that is changing as fast as London. Now that would be a sight to be seen. What an interesting capture. It feels like a bit of the past in modern day London. I have never heard of cockney funerals... Thank you for showing us this event, I can understand why they are rare now! This would be fascinating to see in person, but so long as I can't be there, thank you for this exceptionally fine image.